Electrolyte Stamina by Trace Minerals Research changed my health for the better. It gives me energy and concentration. my body absorbs water much better. I was having intense salt cravings and blood work showed my electrolytes were low so I tried Electrolyte Stamina by Trace Minerals Research and it has worked wonderfully. I love that they are pills so I don't have to drink a sweet electrolyte water. High Performance Energy Formula of Balanced Ionic Minerals. - P-5-P and L-Taurine to help increase stamina and reduce cramping! - Sodium‚ Potassium‚ Calcium‚ Magnesium‚ & Chloride for efficient hydration. 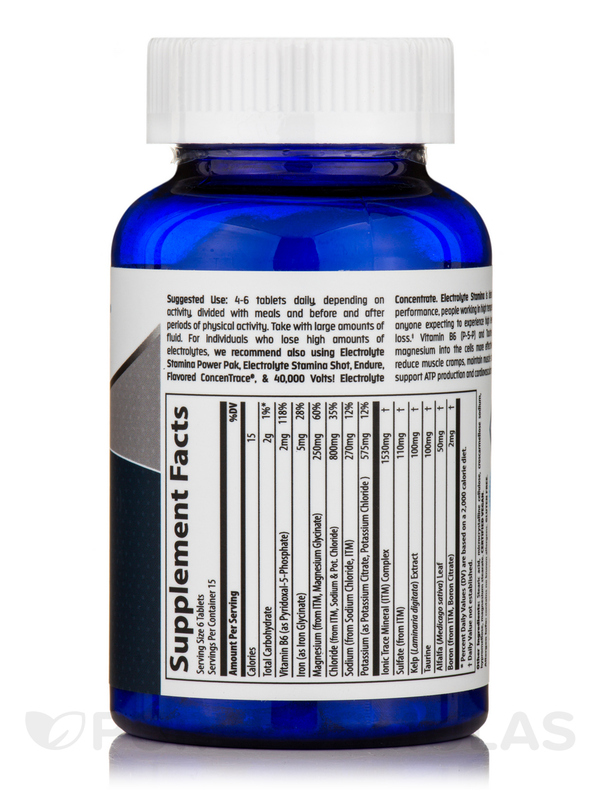 - High performance energy formula of balanced ionic minerals. 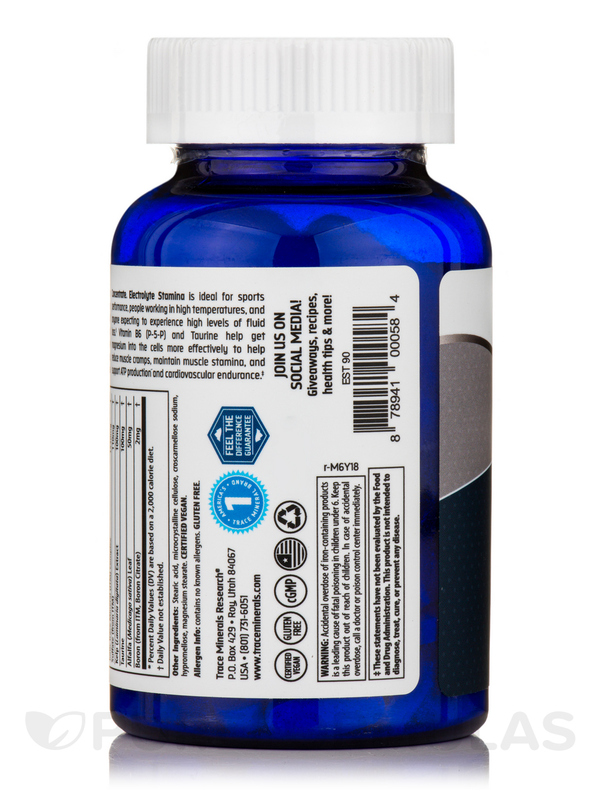 New & Improved Electrolyte Stamina is a dietary supplement that is ideal for sports performance‚ people working in high temperatures‚ and anyone expecting to experience high levels of fluid loss. P-5-P and L-Taurine help get magnesium into the cells more effectively to help reduce cramps and increase stamina and energy. You may expect a wide spectrum of nutritional benefits. 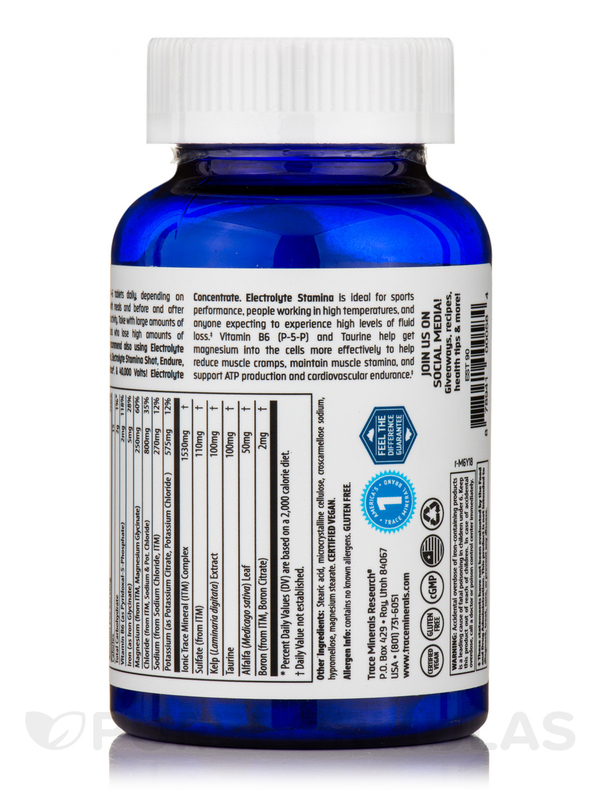 Electrolyte Stamina Tablets replenish your body’s lost nutrients during activity so you can perform at your best. These nutrients help conduct the electrical energies and balance fluid absorption and pressure throughout the body so you can feel recharged. In fact‚ by taking Electrolyte Stamina Tablets after a hard workout (or during periods of hot weather)‚ we guarantee you’ll feel a difference within 60 minutes or we’ll refund your money with no questions asked. Other electrolyte products consist of only a few electrolytes. Our Electrolyte Stamina Formula is packed with not only the major electrolytes‚ but all the minerals in electrolyte form and balance – with no sugar or sucrose. So you get the natural goodness of every mineral and trace mineral as they interact in perfect balance to help maintain optimum health. It’s a totally natural way to replace lost nutrients and help you re-energize. For over 35 years‚ Trace Minerals Research® has been providing high quality nutritional supplements to the natural products industry. All the minerals from 1 tsp (4.9 ml) of a unique blend of low-sodium ConcenTrace® and Inland Sea Water™‚ concentrated and dehydrated from Utah’s Inland Sea‚ the Great Salt Lake (equivalent to the content of 5 oz. sea water‚ sodium reduced). *Daily Values (DV) are based on a 2‚000 calorie diet. Ingredients: Vegetable Cellulose‚ Vegetable Stearic Acid‚ Modified Cellulose Gum‚ Vegetable Magnesium Stearate. Also includes over 72 ionic trace minerals and elements found in seawater. ConcenTrace® is a trade name for concentrated sea minerals from the Great Salt Lake. 4-6 tablets daily‚ depending on activity‚ divided with meals and before and after periods of physical activity. Take with large amounts of fluid. In case of accidental overdose‚ call a doctor or poison control center immediately. My husband takes them, however we need to find one that does not have iron in it. My husband claims he feels the difference. Great for those on Keto diet. 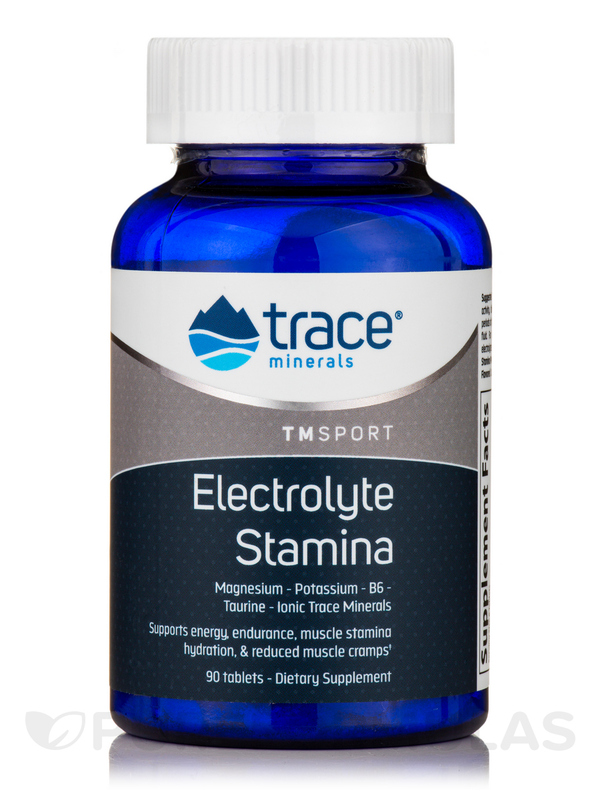 Electrolyte Stamina by Trace Minerals Research was a life saver for me as I struggled to get enough potassium and magnesium while on ketogenic diet. While the diet helped me lose lots of weight - 45lbs in 8 months, my energy was always zapped due to lack of proper minerals and electrolytes. Along with green leafy veggies everyday, I am feeling much better, clear mind and plenty of energy. I will never let my supply of this product run dry. Awesome! The pills are small and easy to swallow. I have used Electrolyte Stamina for 2 months and it has changed my health. I had just completed chemotherapy and felt extremely dizzy hungry and fatigued all of the time. I had to spend up to 3 days in bed at a time because I thought I was tired. Only to then realize I was completely dehydrated and was mistaking my thirst for hunger. From the first day I took Electrolyte Stamina my dizziness subsided and my appetite went down. I also did not have to go to bed during the day. Im so pleased with Electrolyte Stamina and recommend it to everyone; whether or not you "think" youre dehydrated. Usually we dont recognize it when we are dehydrated. My sister recommended Electrolyte Stamina as other women at her gym told her it got rid of headaches brain fogginess fatigue stress anxiety and grumpiness. These can all by signs of dehydration. I also want to note that I was drinking electrolyte water after chemo but since my intestines/digestion was pretty much destroyed I could not assimilate the water I was drinking. Just because you drink a lot of water does not mean you can absorb it properly.